505 Temporary Fabric Adhesive is the ultimate quilter’s and crafter’s product for quilting, embroidery and paper crafts. It washes away with soap and water and will not gum up your hand sewing or machine needles. Just spray 505 lightly on your quilt back and batting and your basting is done in a matter of minutes. Don’t worry if you make a mistake it is completely repositionable; just remove your fabric or paper and set it back in place. The need for safety pins and basting stitches is eliminated in one simple step. This multi purpose product is acid free and will not damage paper crafts or stain your fabric. 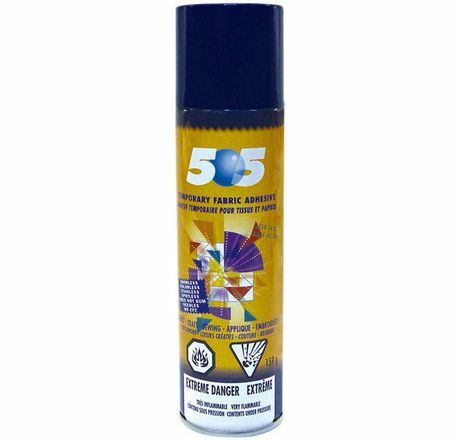 505 Temporary Adhesive Spray contains no ozone-depleting CFC’s so you can enjoy your hobby worry-free.